Four scientists, 1 woman and 3 men, conferring over a DNA gel. The scientists, featured in the video "Driving Forces" are Douglas Clark, Drs. 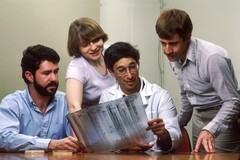 Suzannah Gal, Robert Fleischmann and Bruce Troen who worked in NCI's Laboratory of Molecular Cell Biology in 1987.